Creating a coordinated image for a jewelry is fundamental for a shop: take a look to our jewelry packaging! 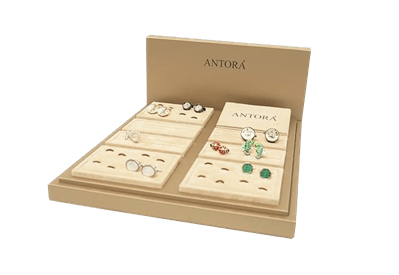 The jewelry packaging selection, and so, the creation of a coordinated image, are the most important aspects that you should take care of, when you have to manage a jewelry store. The image in fact, constitutes the first customer approach with our products, and thus it should be studied in detail. The jewelry packaging therefore, is your business card: if you make a good impression, you are halfway through! The visual merchandising is an operational marketing strategy, and nowadays, more and more jewelers are realizing the importance of the brand identity, which is important not only for products but also for the stores. The visual system is essential for a jewelry store as the visual impact has a strong evocative power of imagination over potential customers who, struck by the elegance of the jewelry packaging, they will be further encouraged not only to enter your jewelry, but also to buy your valuables. What is a coordinated image? The coordinated image is a system of colors, shapes and fonts, designed to make your jewelry, unique and recognizable at the customer’s eyes, and this can be possibile through jewelry packaging personalization. 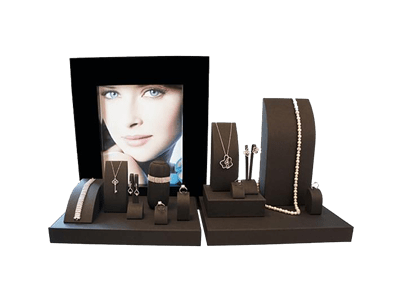 The coordinated image elements ( such as jewelry display stands, jewelry roll, earring display) are coordinated with each other, both in colors and shapes, to create an “all-one object”: products and merchandise layout are melted into a single image, and this combination of unique elements will distinguish your shop from the other jewelers. Sometimes jewelry packaging can be more efficient than a commercial! How to take care of your jewelry visual brand? Nowadays customers don’t buy only your product but also the image which revolve around the object, such as custom packaging or the jewerly display: they buy an idea. That's why the choice of a jewelry packaging becomes crucial: the creation of a brand identity through the coordination of all the elements that make up the installation of a jewelery window, will give even more value to your jewelry! Thanks to the planning of a coordinated image, you will not sell a simple necklace, but an idea: your jewelry will then become invaluable. 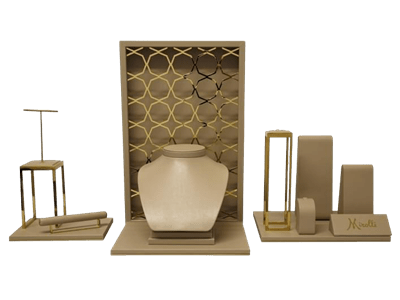 To Be Packing offers you a chance to build a unique image, proposing a wide range of jewelry displays; starting from the request of customize ring boxes, To Be Packing will create your coordinated image, taking care of all sale items: from jewelry boxes to the custom paper. The suspended base is a great classic of the jewerly display: it is simple but at the same time, extremely effective; it is the ideal jewelry display stands for who wants to give a touch of color and personality to a store. A hidden rise will lift your jewelry, making them shine like a star! 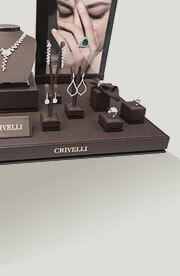 One of our latest innovations is the PRINCIPE display for jewels. Elegant and impressive, its refinement is also enclosed in gold or silver details that make it a real jewel! The Multivetrina embodies sophistication and practicality. Tobe Packing offers you as many as 3 different sizes, suitable for all needs; the interior, removable and interchangeable, allowing to your dislay for jewels, to get a unique style! This beautiful Multivetrina is also characterized by a back which you can customize with your store name. Discover all our jewelry packaging to give your shop a coordinated and priceless image!